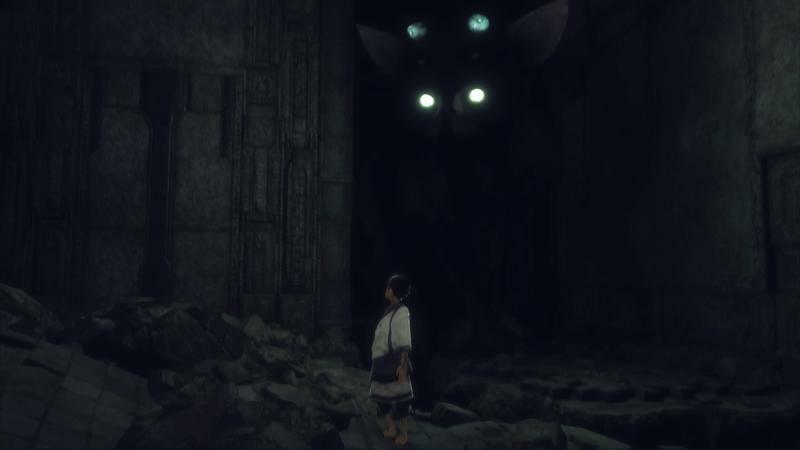 The Last Guardian is here. This thing was approaching Half-Life 3 status, wasn't it? Sony revealed it during the PlayStation 3 days. Director Fumito Ueda and Team ICO, the makers of Ico and Shadow of the Colossus, were building something new. This new something was shown off in 2009. It's supposedly been in development since 2007. This thing has been just about 10 years in the making. It was delayed multiple times. Its cancellation was heavily rumored at one point. Ueda left Team ICO and committed to finishing the game as a contractor. It switched from PS3 to PS4. Its development was tumultuous. Here we are now, the day before it comes out. I played The Last Guardian, and I loved it. 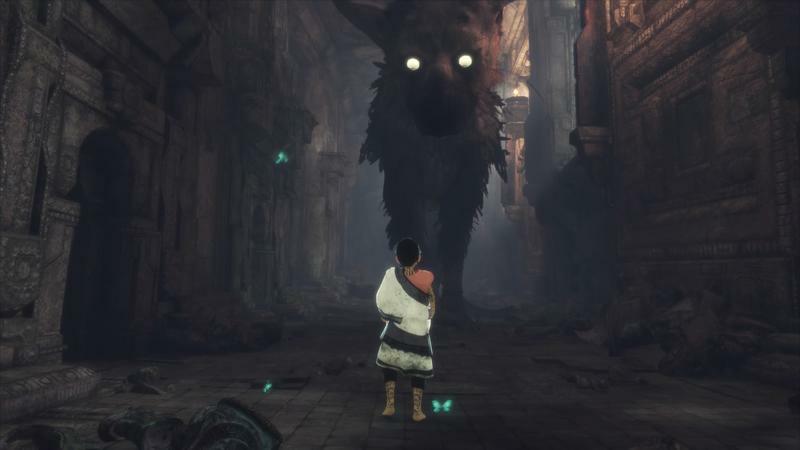 The game features a boy and a beast, a pair made friends through a harrowing adventure. Playing the boy, you'll ascend aging ruins, take on stone guards, climb the beast, pull spears from its feathered hide and fall in love. This game is really nice. Trico may be the most fascinating gaming character ever. 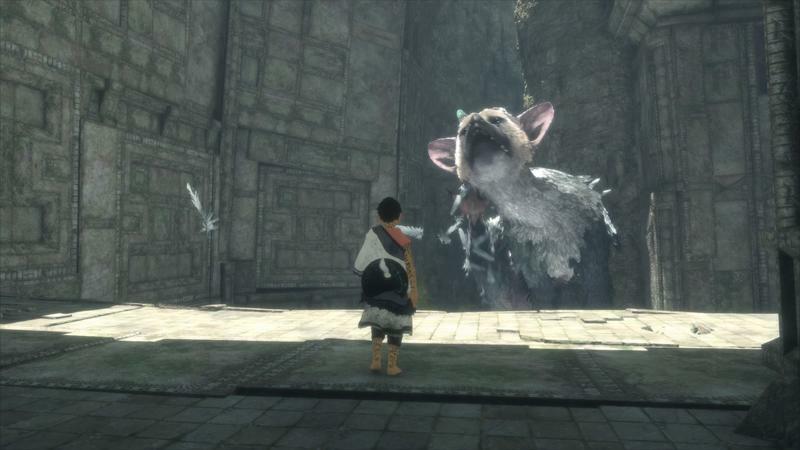 What's most interesting to me about The Last Guardian, and, perhaps, the thing that wowed me the most, is Trico. 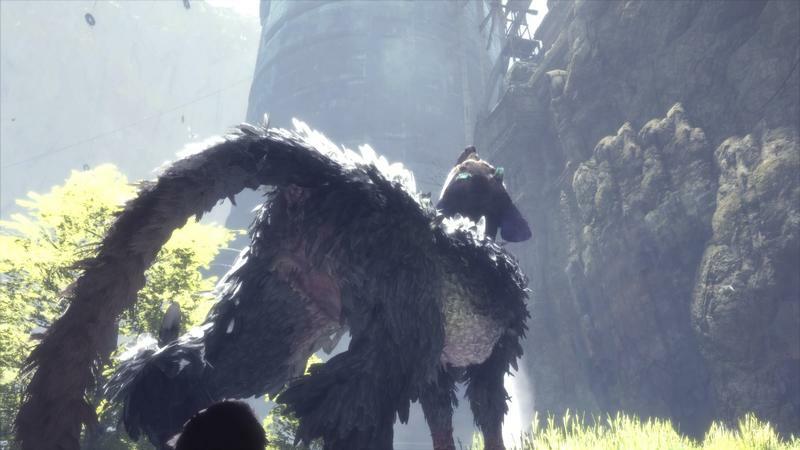 Trico, you know, the giant bird/dog/cat creature with blue horns. The cat bit? 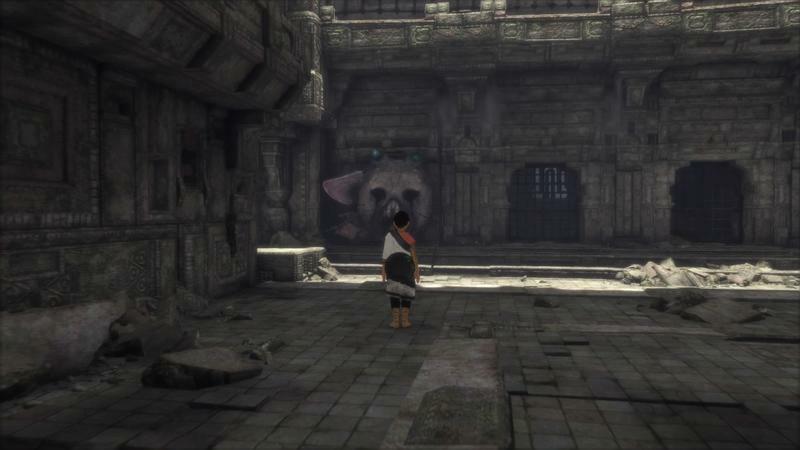 I didn't really see it until I played the game and watched Trico move. The beast is slow, deliberate and cautious, yet it's capable of huge leaps and awesome climbs. Then I thought about how Trico sounds, and I thought about how it might sound in Japanese. Trico wouldn't be pronounced "Trico." It would be pronounced "Toriko." The Japanese word for bird? Tori. The Japanese word for cat? Neko. That's not what I liked most about Trico, though. In fact, what I liked most about Trico was what I initially disliked the creature, and largely the game, for. Trico is slow. It booms along behind you with thuds and groans, and you, the boy, have to feed it, call it and guide it along in order to move through the ancient ruins. Grueling is the word I lean on for this. 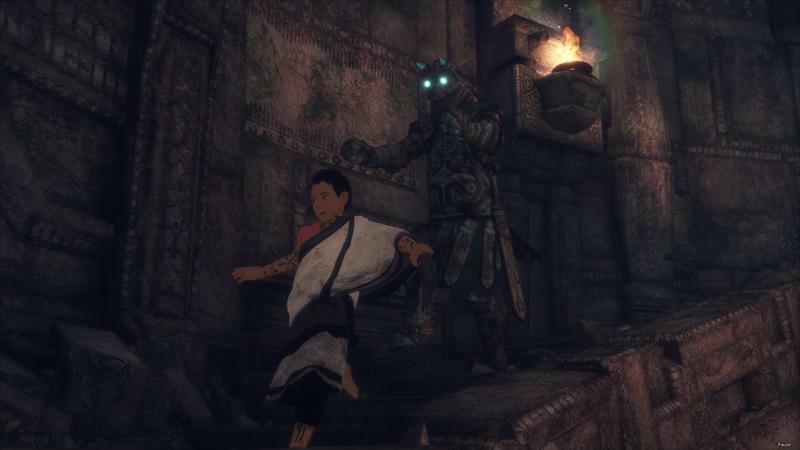 You'll have to coax Trico down from terror and agony. Sometimes you'll clumsily climb all over him, wrestling with the camera in moments of action while trying to figure out what, exactly, to do next. At other times you'll wait. 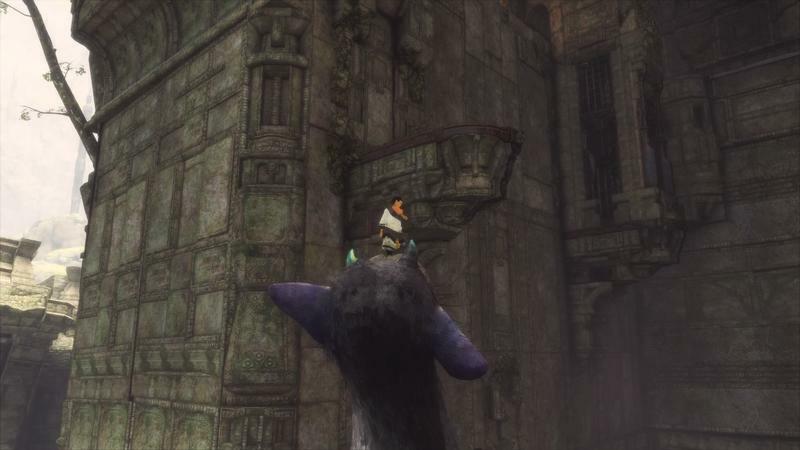 You'll sit on Trico, and you'll wait as the beast looks around and thinks up a route or its next step. 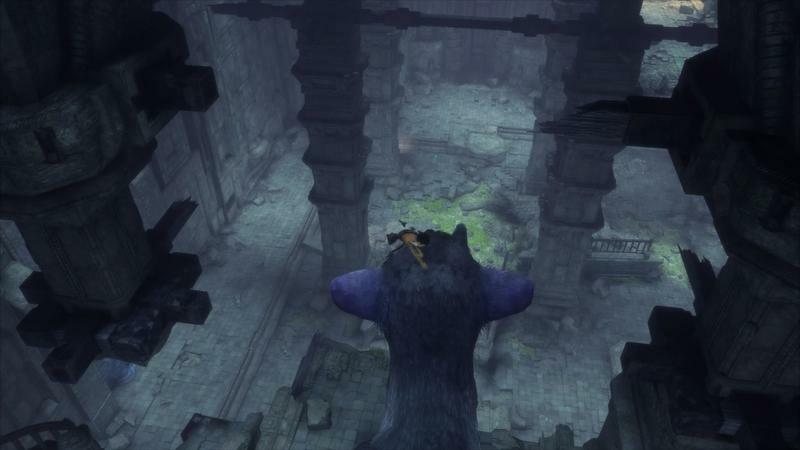 This waiting for Trico to do something is annoying, though it becomes more of an issue as the game moves on. Puzzles get harder, and clues become more subtle. You'll stand on Trico, pound on its back and point in different directions to see if the creature will simply react. 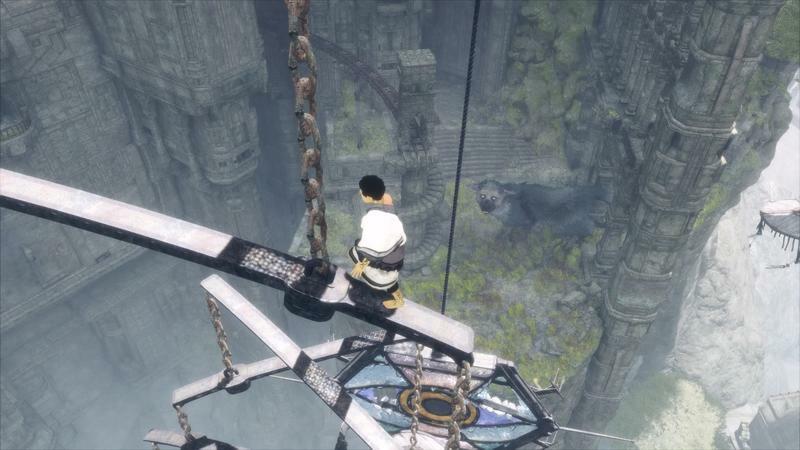 It takes time, and I can't help but wonder how much longer this game is made because of time spent waiting on Trico. 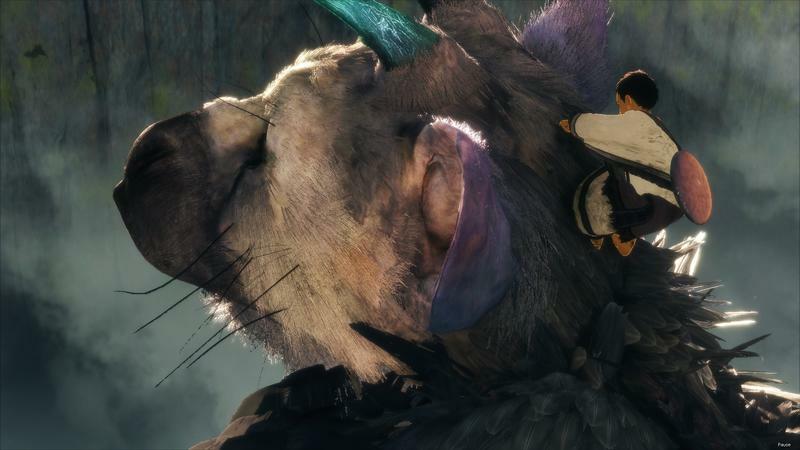 As you and Trico spend more time together, the creature seems more methodical than slow. By two or three hours in, I loved Trico. I loved the way the beast seemed lifelike and ponderous. 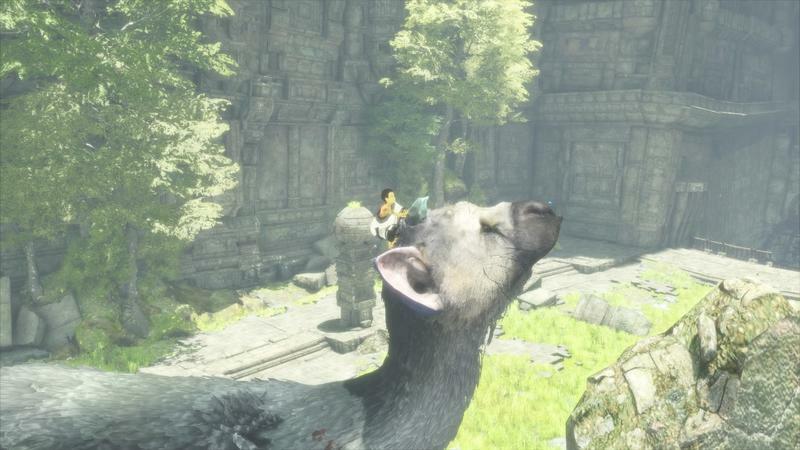 Sure, the cracks show sometimes and Trico is simply just a piece of code in a video game with animations and scripting, but those moments are rare when compared to the beast's behavior otherwise. Trico seems alive. I came to depend on him. He saved me from falling, saved me from being carried away by stone guards, saved me from so much on our journey, and all of those moments felt really good. 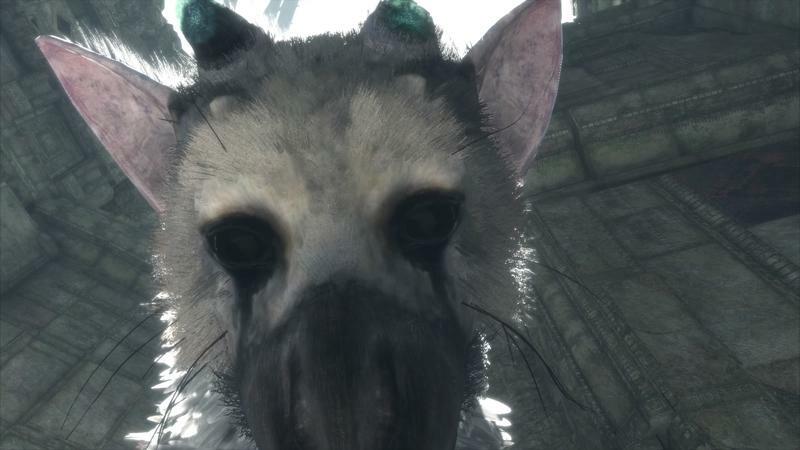 Once Trico was fully revealed for The Last Guardian, fans developed this sense of, "oh, I'll love this animal, I'll love him and he's totally going to die." 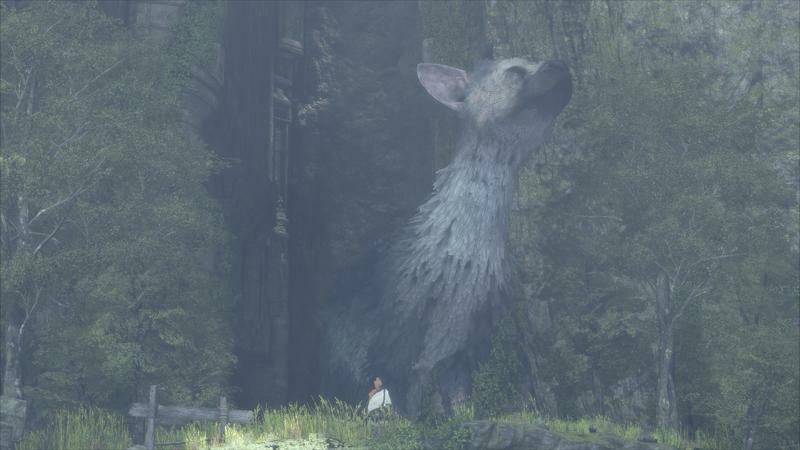 While I won't spoil what happens, I will say that you will bond with Trico. 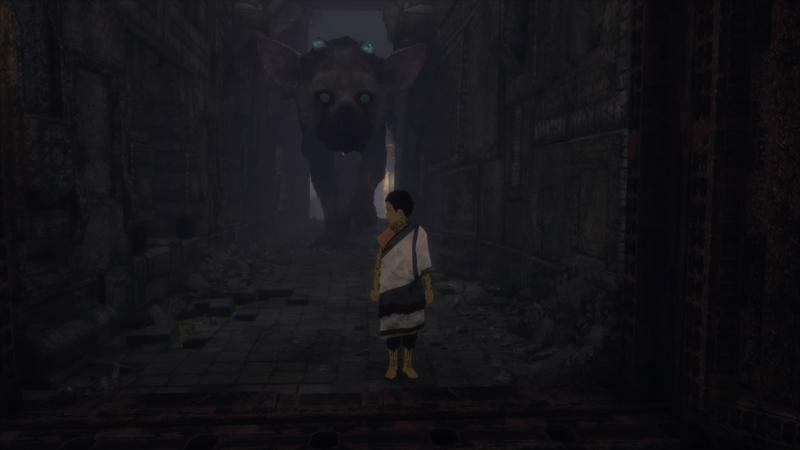 This symbiotic relationship is the center of The Last Guardian. It's why I loved the game, and it's what affected me most. Trico is amazing. Not just as a companion, but as a piece of video game tech, and that's something special. Team ICO still struggles with camera and control. 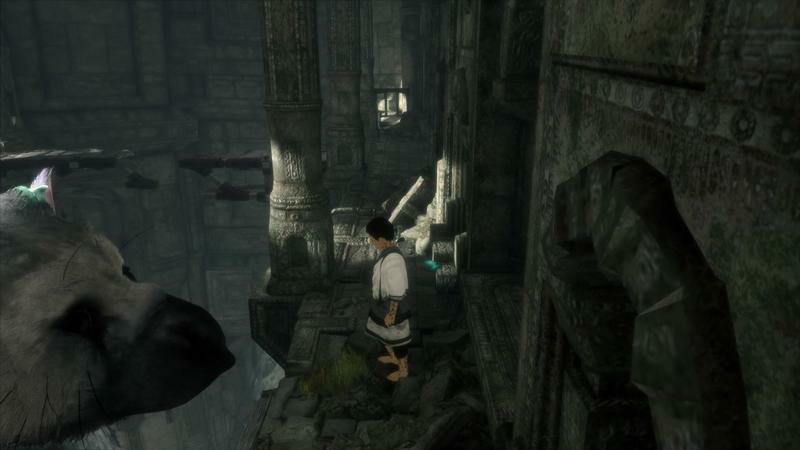 Much like Shadow of the Colossus, in order to get to the quality of The Last Guardian, you'll have to wrestle with the camera and controls. At times, the camera works beautifully. It sits on the right analog stick, and you'll sweep over at speeds both smooth and precise. When the game zooms back and tries its hand at cinematic moments, the camera works in time with the action and music. 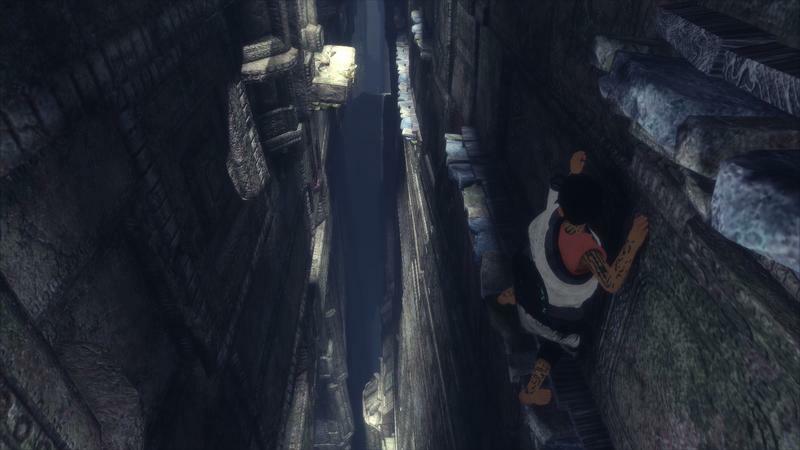 Then you'll find yourself up against a wall, tangling with the armored guards while scrambling over Trico's body. The camera will black out, it'll swing inside the beast's body exposing the back end of its eyeball models. You'll struggle to focus on what you need to do or where you need to go, instead relying on shoddy guesswork to get through the moment. The same goes for the controls, too. There are moments when the boy's animation and movements feel packed with realistic momentum. The boy runs in place when he's in danger, he slides and falls if you stop short and he skitters down steps at speed with his whole body. There are times when you'll shamble up platforms and tangle from impossible heights and it feels so good that it's hardly like you're controlling anything. Then, again, you'll wrestle with your control as you twist and contort in order to jump off of a chain or toss a barrel in the right spot. This will come up during intense moments, too, and I found myself blaming the controls for my downfall more times than I want to admit. Team ICO fans know this. They understand it. They expect it. While frustrating, the controls and camera are something you can and should get used to. These issues, coupled with the sometimes slowed frame rate in areas with tons of finite movement, are the sole negatives I have with The Last Guardian. In fact, looking back on puzzles that I found a touch too difficult or segments a bit too obtuse, I routinely found fault with the camera or controls in those instances. Were they better, I wouldn't have struggled. Just like Shadow of the Colossus and Ico, it's passable. You'll get used to it. You'll even excuse the game for it when it reaches those beautiful high notes that come so often. A strong story meets interesting, albeit subtle, puzzles. If you're new to the site or our gaming reviews, welcome. I won't spoil any game's story. 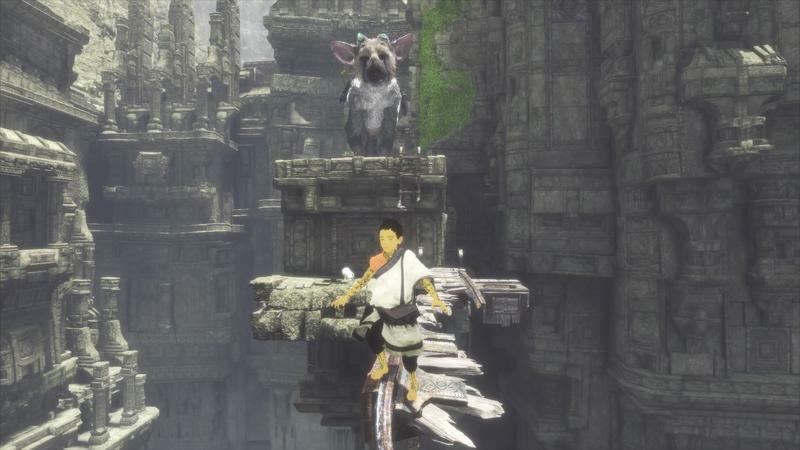 If you've been looking to fly into The Last Guardian blind when it comes to the story, I get it. This game has one, it's decent. I'll offer that the best story details aren't the overt ones. 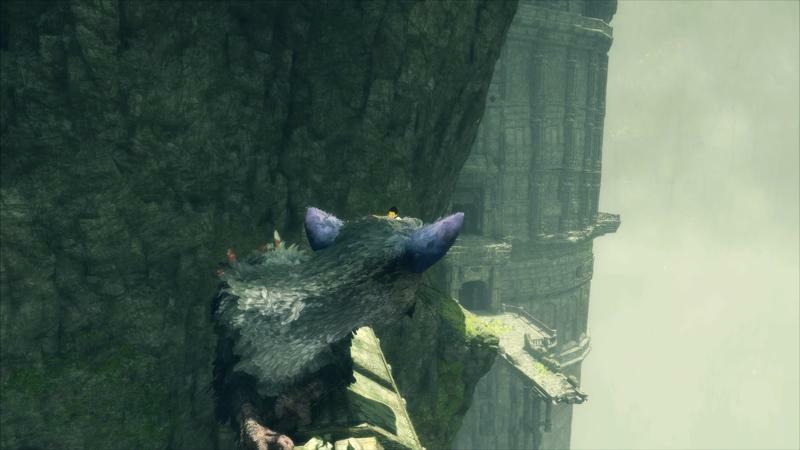 Instead, take time to look around the world, consider the spoken bits closely and ponder Trico. Those points are actually really wonderful, and they add up to more than the point to point plot, in my mind. Sometimes, the design of The Last Guardian is beautifully subtle. There's this certain language in games that we've all come to learn, whether we notice it or not. Think about, perhaps, Assassin's Creed as a point of reference here. Since the first game, we learned that you'll always find a haystack below a group of gathered birds. Dive from there. Consider Zelda (especially the old overhead ones). You'll always be able to blow a hole in a wall that looks a specific way. The world design and art direction actually inform the way players play, and games that do it well iterate on these puzzling touchstones as the experience moves on. For the most part, The Last Guardian stacks these puzzles really well. You'll solve sections with increasing complication, and, with the exception of the final "boss" (I strain to call it a boss), they all make subtle sense. It's actually really nice. 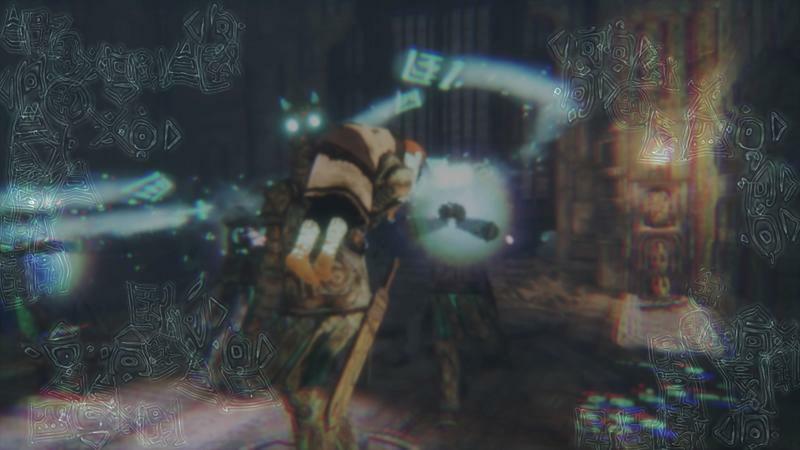 You're rarely hit with an area that feels downright unsolvable; instead, the game gives you the right amount of clues without hammering you over the head. If your progression stops for too long, the stoic narrator will speak up with a clue, though it's never overdone. Here's a slight hint that's never discussed in the game, save for the options menu: Click and hold down the left stick, and the boy sits to meditate. The narrator will give his clue again, and the boy looks wonderfully pensive. When this game opened up, I was frustrated. It felt like something that was designed 10 years ago, only with prettier graphics and some modern trappings. I'm a fan of Team ICO. Shadow of the Colossus is one of my favorite games. 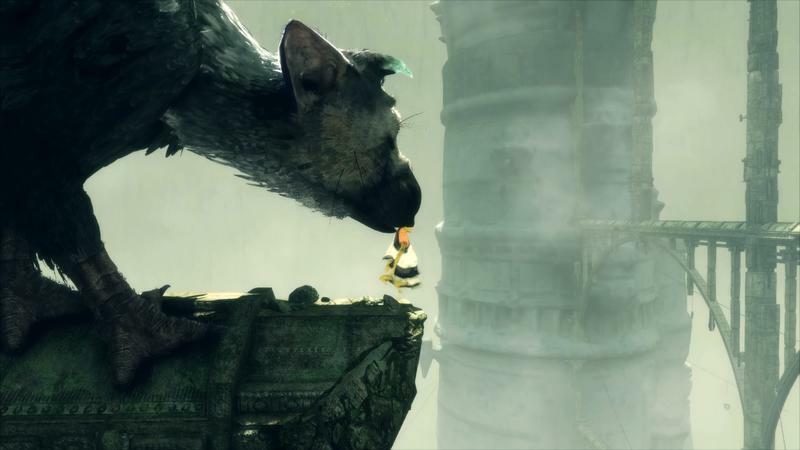 I wasn't ready, however, for The Last Guardian to initially feel as old as it did. Get over that. Get over the sometimes annoying camera. Get over the awkward and slow controls. Embrace the puzzles. 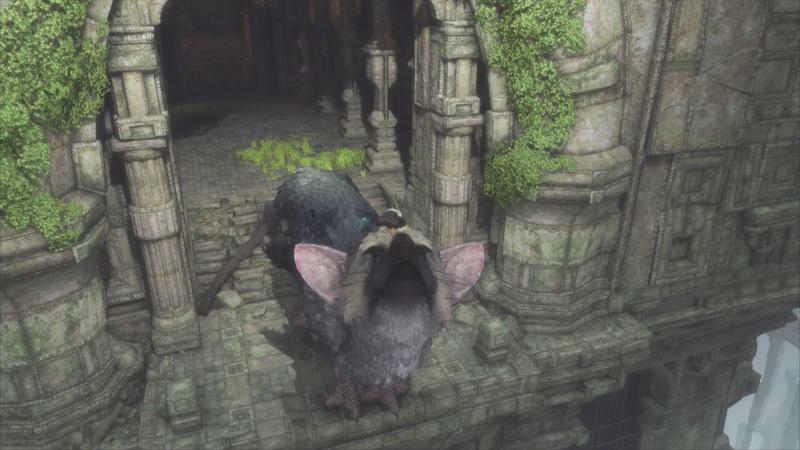 Embrace the patience required to love Trico. Explore this game for all it's worth, because it is special. When we write reviews ahead of the embargo, it's rare to talk to other writers. I have no idea what others think of this thing so far. I could be a far outlier when it comes to my opinion that The Last Guardian's faults are worth looking beyond. I'll stick by that, though. This game's haunted me since beating it last week. 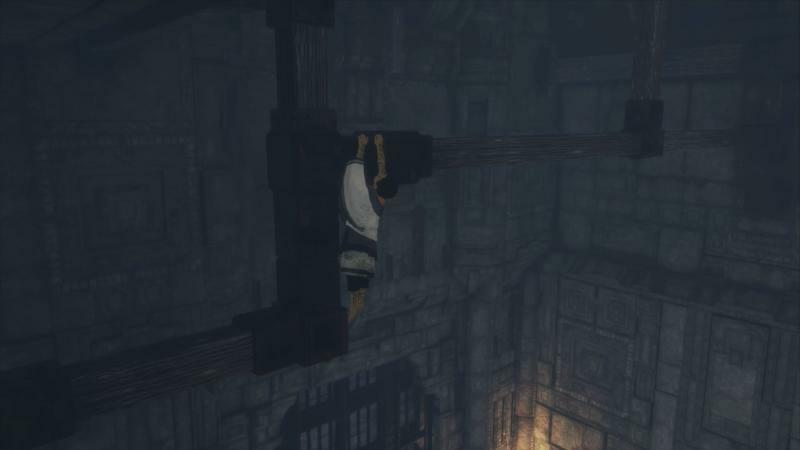 I sat over the weekend, and I thought about the momentum it had and how it felt to climb Trico and work with him to solve puzzles. 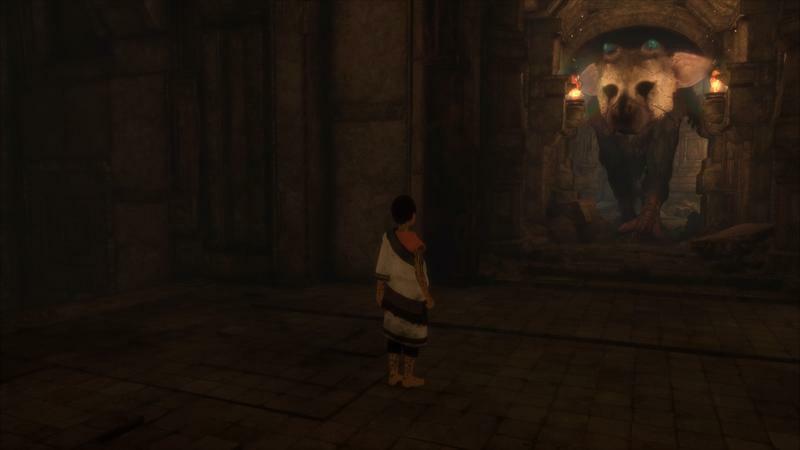 Will you be able to look beyond The Last Guardian's aging problems? If you can, a wonderful game awaits you. I thought I was going to hate this thing after the first hour or so. I was wrong, it's an enthralling experience. Disclaimer: We received a physical copy of The Last Guardian from Sony for this review. It included a box, code for the game's soundtrack (which is good), a letter from Fumito Ueda and a feather. Yes. A feather.